Tenerezza is a 3D Action RPG for PC and Xbox. 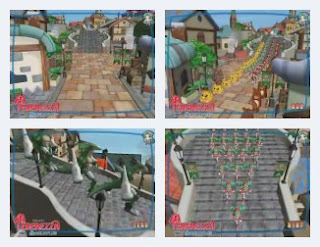 The benchmark sees the game characters parading through a village. Cute music and graphics. On start, a config screen allows to play the benchmark window/full screen, and loop no/yes. Runs only in 640x480. The short running time makes this almost bearable, as the characters are doing nothing except walking. Not recommended.